No Christmas presents for grown ups. Christmas presents are for kids. What is Christmas about? 'Tis a question as old as time, as old as Jesus himself (2000 years or more). I know the answer and here it is: Christmas is about giving. Yes, it's about lights and family time and singing songs that you don't sing at any other time of year, but at its sweet, candy core, Christmas is about giving to others. That's what makes it special; the rest of the year, we all just take and take and take and screw everyone else in order to "get ours." At Christmas time, we give. Christmas is for kids. Kids are the only ones young and dumb enough to believe in myths like flying reindeer, or a fat man climbing down chimneys, or "peace on earth." Grown ups are too jaded and careerist and obsessed with social climbing and mundane concerns like paying the mortgage and not getting sexually transmitted diseases to devote much time to contemplating the ideals of Christmas. The Christmas season only reaches its full, transformative potential in the minds of children. For them, Christmas is magic. For adults, Christmas is just a hassle with a fun halo, like throwing a dinner party for too many guests. Grown ups are bad. We do bad things. We lie. We commit serious crimes. We rob the poor, we systematically exploit the weak, we devote our lives to accumulating power for ourselves at the expense of others. We double park. We leave the bathroom without washing our hands, and then shake hands with the boss's wife right after that, and then sleep with boss's wife not long after that. We are flawed creatures. If we were ever without sin, that time has surely passed. Grown ups need redemption. Christmas is our chance. Children need to believe in magic. Christmas is their chance. If everyone plays their role properly, then Christmas can, indeed, perform magic: the magic of cleansing our dark souls for at least a single day. We are blessed with an annual reminder, printed right there on the calendar, that December 25 is the day that we do something nice, for once, before returning to our default mode of selfishness disguised as libertarianism. Here is our only hope: give Christmas presents to kids. No Christmas presents for adults. We give. Kids get. It's a simple plan of enforced righteousness that represents our only chance to get on the right side of karma before the year ends. Think not of what you want for Christmas; think only of what sort of contraband other people's children might want, and give it to them. A few little presents for grownups here and there are fine, but none of us should be assembling Christmas lists of things we want, like kids who have lost their innocence but maintained their brazen greed. If someone asks what you want, tell them to donate to a charity for you. Not because you have a pure soul, but because you don't have a pure soul. Our souls need all the help they can get. Have you looked at a calendar? Christmas is less than a week from the end of the year. This is serious last-chance redemption, here. Do not miss out. Also, kids are easy to shop for (toys and candy). Adults are hard to shop for ("But I wanted a red Porsche!"). If we all agree not to get presents for one another, we all win. Merry Christmas, kids. We are feeding your unsullied spirits with uncommon generosity in a desperate attempt to redeem ourselves for eleven and a half months of wickedness. 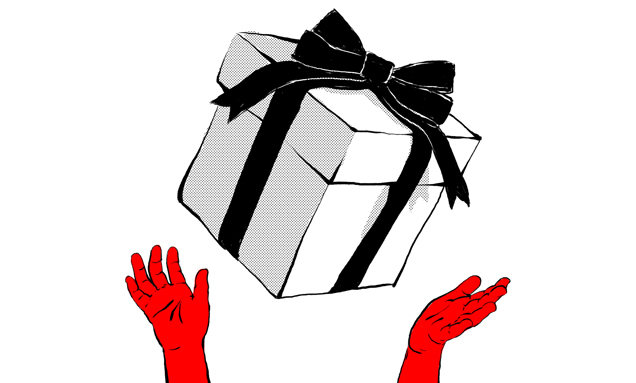 Enjoy the presents, while you still can.